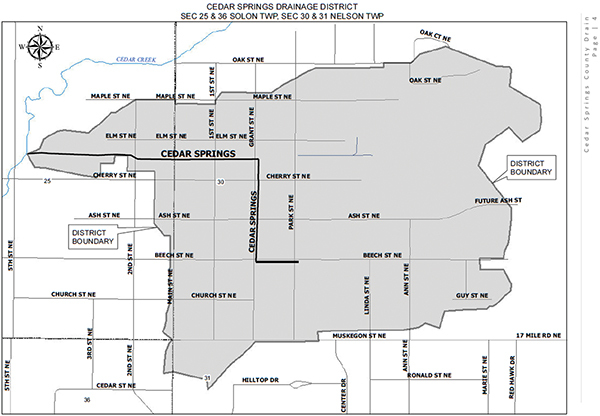 The Kent County Board of Determination met last Thursday evening, June 21, at Cedar Springs High School to consider whether a petition to relocate the Cedar Springs Drain was valid. After hearing testimony from Kent County Drain Commissioner Ken Yonkers, assistant Drain Commissioner Doug Sporte, other public officials and members of the audience, the three-member board voted unanimously that the 80-year-old drain needs to be moved. The reason is that it runs under several buildings and lots, and if it collapsed, it could be a hazard to anyone in the building. “When we have drains that old, we replace them,” said Yonkers. “If a drain fails under a building, the floor will sink.” He spoke about a old drain that collapsed last year under a Lowe’s parking lot in Grand Rapids and created a huge sinkhole. Currently the drain runs west along Beech and north on Grant Street, then west again between Cherry and Elm, under some Main Street businesses, under the parking lot where the old community building stood and westward to Cedar Creek. The relocation of the drain would affect the following properties: 18-20 N. Main; 23-25 N. Main; 45 Third St.; 141 W. Cherry St., and 145 W. Cherry St. Once a new drain is in place, the old drain will be filled with a substance to keep it from being used any longer. The assessment for the project will affect many of the properties in the city, especially on the east side. However, the city will also be assessed a portion, and other properties in the city will help with that tax burden. The problem of the drain running under buildings came to light when a business wanted to buy and remodel the Gun Tavern and turn it into a sit down restaurant. They want to expand it in the back, but are unable to because of the drain. The City is facing the same problem with the lot they want to build the new fire station on. The Drain Commission holds an easement wherever the drain pipe is located and won’t allow any development. However, the board was quick to note that they don’t base a decision on economic impact. “It’s based on health and safety,” they said. The engineer for the city will now be looking at the best way to reroute the drain. Once they know how much it will cost, they will then know how much the properties in the drainage area will be assessed. When that point is reached, they will hold a “day of review” and will explain how they arrived at the percentage each property owner will pay. “It’s based on the benefit to your property,” said Yonkers. Several of the people at the meeting complained that they didn’t get a notice about the meeting and didn’t know about it until they read it in the Post a couple of weeks ago. We didn’t get one here at the Post either, and we are also in the drainage district. We wondered if maybe it was because we have a PO box and cannot get physical mail at our building. Many others within a few blocks of the post office have the same problem. So we asked Sporte if they had sent any to PO boxes. He confirmed that they did not use PO boxes, only street addresses. So we then went to the Cedar Springs Post office and asked if they remembered seeing a large group of letters come through that would’ve been from the Kent County Drain Commissioner, but were missing PO #s. They said they did not see anything like that, and if they knew whose box it was, they would’ve put it in there. If they didn’t, they would return it. However, Sporte said that they didn’t receive any letters back. So it remains a mystery where the missing letters went.